As collateral rules have grown in complexity, so has the need for greater optimisation – But as Tim Steele [of Funds Europe] discovers, achieving that can be painful. Collateral has long been used as a tool for mitigating counterparty risk and obtaining credit, but now more than ever, it is the key determinant of an institution’s ability to engage in financial transactions in the cash or derivatives markets…. “If you optimise every pool or silo individually, as a firm you will by design not be optimised,” says Bimal Kadikar. Leadership, especially in critical, but technologically-challenged functions like collateral management, is the key to seizing a competitive advantage. IT innovation doesn’t just happen, even in the capital markets where opportunities for substantial improvements in areas like collateral and liquidity management can lead to greater, measurable and sustainable returns. All IT innovation needs commitment, investment and a strategy to make a difference. But most importantly, it needs unwavering leadership if it is to deliver the competitive success it promises. And here lies the conundrum. Bank executives already allocate hundreds of millions of dollars (even billions) annually towards technology budgets, yet they are still being bombarded by the claims of a myriad of new developments and solutions that promise an elusive holy grail. How should the business digitize, become platform-based and leverage open architectures to drive data management strategies that deliver intelligent information? Finding the key to this will strengthen decision-making across all front-to-back office functions. But it’s not surprising that there is resistance to change, with perennial questions to be answered such as: Why can’t we get more out of our existing IT estate? Will that spend even deliver half of what it promises? What disruption will there be to existing systems while this takes place and how long will it take? These are understandable executive concerns, given the time consumed by regulatory compliance, the dynamics of a rapidly changing market, and constant pressures to reduce costs and improve margins. Also, not unnaturally, executives lean heavily on historically well-resourced internal IT teams to guide future decision-making, and hence investment. But it still came as a shock to many when a 2015 Accenture Report estimated that 96% of bank board members had no professional technology experience, while only 3% of bank CEOs had any formal IT knowledge. At the same time, another study said that the top 10 banks have more IT personnel than the top 10 financial software vendors. Some say that “ignorance is bliss”, but others counter, “If that’s the case why aren’t there more happy people about?” And this reveals the dilemma. A lack of IT and business alignment in banking has been a thorny subject for years, constantly framing the two sides as adversaries, rather than partners. These differences often create a chasm of understanding of the priorities, objectives and vision of “success” for each side, effectively stagnating progress toward the necessary transformation. Take, for example, collateral management. We know processes are often gridlocked, liquidity constrained, technology inflexible and access to pertinent data denied by historic silos and working practices. Every week we see how this results in lower capital returns and impaired profitability, at a time of increased competition and shrinking margins. What used to be a straightforward back-office task to ensure sufficient and appropriate collateral has become mission-critical in pre-trade decision-making as constraints on capital, regulatory pressures and efficiency mandates demand optimized collateral deployment firm-wide. But recognizing the problem is only the first challenge. Attempting to fix system pitfalls with a few bandages on already stretched legacy systems tends to compound the problem over time. Experience shows that wider collaboration is feasible – and is working. Banks are now better able to lean on the expertise of outside IT vendor expertise, whose claims are not only battle-proven but are ones that complement rather than threaten internal teams. Developing collaborative partnerships with the business, internal IT and select external vendors who bring new ideas, innovation and experience to the table can significantly advance the firm’s technology objectives. Furthermore, there is a greater willingness to consider cloud-based solutions, as cost benefits and improved resilience start to outweigh historic operational risk concerns. This collaborative approach also benefits internal departments by enabling them to deploy talent where it can be most effective. It encourages the injection of fresh ideas into internal debates, complementing existing capabilities with a step-by-step series of tactical enhancements that eventually deliver a strategic objective – without undermining business opportunities or day-to-day operations. If this leads to more effective data aggregation and analysis, there will be better-informed decisions that deliver tangible improvements to business profitability, while also reducing risk and bolstering regulatory compliance. A fresh look at enterprise-wide technologies also lays the foundations for ongoing automation of critical business processes. By starting in a segment like collateral management that impacts all asset classes, business functions and jurisdictions, firms can enable each stakeholder across trading workflows to evolve and provide greater value to the broader enterprise. This should not only produce a more effective and profitable business but a better informed and more confident executive team that is further empowered to deploy technology more widely to the best benefit of the business. Once there, they can probably also have a laugh and raise a margarita to Jimmy Buffett, who one of my island-loving peers quotes: “Is it ignorance or apathy? Hey, I don’t know and I don’t care” – because by then everyone will know and they will care. This article was originally published on Securities Finance Monitor. To download this article, please click here. Collateral management has broadened far past simple margin processing; collateral now impacts a majority of financial market activity from determining critical capital calculations to impacting customer experience to driving strategic investment decisions. In this article, we identify the top five trends in collateral management for 2018 and highlight important areas to watch going forward. The holistic theme driving forward collateral management is its central role in financial markets. Collateral has grown so broad as to make even its name confusing: where collateral can refer to a specific asset, the implications of collateral today can reach through reporting, risk, liquidity, pricing, infrastructure and relationship management. The opportunities for collateral professionals have likewise expanded, and non-collateral roles must now have an understanding of collateral to deliver their core obligations to internal and external clients. We see a common theme running through five areas to watch in collateral management in the coming year: the application of smarter data and intelligence to drive core business objectives. Many firms have digested the basics of collateral optimization and are now ready to incorporate a broader set of parameters and even a new definition of what optimization means. Likewise, technology investments in collateral are starting to tie into broader innovation projects at larger firms; this will unlock new value-added opportunities for both internal and external facing technology applications. The investment cycle in collateral-related technology applications continues to grow at a rapid pace. Collateral management budget discussions are moving from the back office to the top of the house. And partly as a result, the definition of the category is also changing. Collateral management should no longer be seen as strictly the actions of moving margin for specified products, but rather is part of a complex ecosystem of collateral, liquidity, balance sheet management and analytics. The usual, first order investment targets of these budgets are internally focused, including better reporting, inventory management and data aggregation. The second derivative benefit of a more robust data infrastructure focuses on externally facing trading applications, including tools for traders and client intelligence utilities that provide real-time information and pricing for the benefit of all parties. This new category does not yet have a simple name, one could think of it as a “recommendation system” but regardless of name, this has become a major driver of forward-looking bank technology efforts and efficiency drives. As large financial services firms capture the benefits of their current round of investments, they will increasingly turn towards integrating core innovations in artificial intelligence, Robotics Process Automation and other existing technologies into their collateral-related investments. This will unlock a large new wave of opportunity for how business is conducted and what information can be captured, analyzed, then automated, for a range of client facing, business line, internal management and reporting applications. Despite being 10 years since the bottom of the great recession, regulatory reporting requirements for banks and asset managers continue to evolve. Largely irrespective of jurisdiction, the core problem facing these firms is aggregating and linking data together for reporting automation. Due to strict timeframes and complex requirements, firms historically relied on a pre-existing mosaic of technology and human resources to satisfy regulatory reporting needs. However, these tactical solutions made scale, efficiency and responsiveness to new rules difficult. The challenge of regulatory reporting is a puzzle that, once solved, appears obvious. But the process of solving the puzzle can create substantial challenges. Looking at one regulation alone misses the transformative opportunity of strategic data management across the organization. Whether it is SFTR, MiFID II, Recovery & Resolution Planning requirements of SR-14/17 or Qualified Financial Contracts (QFCs), the latest initiative du jour should be a kick off for a broader rethink about data utilization. Wherever a firm starts, the end result must be a robust data infrastructure that can aggregate and link information at the most granular level. At a high level, firms will need to develop the capability to link all positions and trading data with agreements that govern these positions, collateral that is posted on the agreements, any guarantees that may be applied and any other constraints that need to be considered. Additionally, it has to be able to format and produce the needed information on demand. Achieving this goal will take meaningful work but will make organizations not only more efficient but also more future proof. As firms try to optimize collateral across the enterprise, it is critical that they develop reasonably sophisticated transfer pricing mechanisms to ensure appropriate cost allocations as well as sufficient transparency to promote best incentives in the organization. Many sell-side firms have highly granular models with visibility into secured and unsecured funding, XVA, balance sheet and capital costs. And in varying fashion these firms allocate some or all of these costs internally. But many challenges remain, including: how should all these costs be directly charged to the trader or desk doing the trade; and what is the right balance of allocating actual costs versus incentivizing business behavior that maximally benefits the client franchise overall. As we know, client business profiles change through time as do funding and capital constraints. There may be a conscious decision to do some business that may not make money in support of other areas that are highly profitable. Transfer pricing is evolving from a bespoke, business aligned process to a dynamic, enterprise tool. The effort to enhance transfer pricing business models continues to be refined and expanded. Firms that embrace the next iteration of transfer pricing will achieve a more scalable, efficient and responsive balance sheet. This will include capturing both secured and unsecured funding costs, plus firm-wide and business specific liquidity and capital costs. Accurately identifying the range of costs can properly incentivize business behaviors beyond simply the cost of an asset in the collateral market. Ultimately, transfer pricing can be a tool to drive strategic balance sheet management objectives across the firm. Functionally, implementing transfer pricing requires access to substantial data on existing balance sheet costs, inventory management and liquidity costs that firms must consider. Much like collateral optimization, the building block of a robust transfer pricing methodology is data. Accurate information on transfer pricing can then flow back into trading and business decisions to be truly effective. Optimization is evolving well beyond an operations driven process of finding opportunity within a business to an enterprise wide approach at pre-trade, trade and post-trade levels. Pre-trade, “what-if” analyses that will inform a trader if a proposed transaction is cost accretive or reducing to the franchise is important, but this requires an analytics tool that can comprehend the impact to the firm’s economic ecosystem. At the point of trade, identifying demands and sources of collateral across the entire enterprise extends to knowing where inventories are across business lines, margin centers, legal entities and regions. It also means understanding the operational nuances and legal constraints governing those demands across global tri-parties, CCPs, derivative margin centers and securities finance requirements. In a simple example, collateral posted on one day may not be the best to post a week later; if posted collateral becomes scarce in the securities financing market and can be profitably lent out, it may be unwise to provide it as margin. A holistic post-trade analysis, complete with updated repo or securities lending spreads, can tell a trader about missed opportunities, leading to a new form of Transaction Cost Analytics for collateralized trading markets. The need for taking a holistic approach to collateral management has led the industry toward significant business model changes. Collateral is common currency across an enterprise and must be properly allocated to wherever it can be used most efficiently. This means that traditional silos – repo, securities lending, OTC derivatives, exchange traded derivatives, treasury and other areas – need to be integrated. Operations groups that have been doing fundamentally the same thing can no longer be isolated from one another; the cost savings that come from process automation and avoiding operational duplication is too compelling. On the front-office side, changes needed to impact trading behavior, culture and reporting to name a few are often very difficult to implement over a short period of time. Despite similar flows and economic guidelines, different markets and operation centers, even though all under the same roof, traditionally suffer from asymmetric information. To address this challenge a handful of large sell-side players have combined some aspects of these businesses under the “collateral” banner, sometimes along with custody or other related processing business. Others have developed an enterprise solution to inventory and collateral management. We expect that, more and more, management is seeing the common threads and shared risks involved. The merger of business and operations teams translates into a need for technology that can be leveraged across silos. The business of collateral management is reshaping every process and silo it touches. While the trends we have identified are not brand new, they all stand out for how far and fast they are advancing in 2018 and beyond. Financial services firms that take advantage of these trends concurrently and plan for a future where collateral is integrated across all areas of the business will improve their competitive positioning going forward. To add a sixth trend: firms that ignore broader thinking about collateral management technology do so at their own peril. Capital markets firms are faced with tough choices in their vendor and utility selection. But when should firms choose to partner with vendors, participate in industry utilities or insource development altogether? This article provides a framework for thinking through the options. Capital markets have always been fast moving but seldom have the drivers of change come from so many directions at once. Both buy-side and sell-side firms are contending with simultaneous pressures to comply with new regulations, find new ways to generate revenues and to cut costs. What makes this environment even more challenging is the interaction between these competing goals. Implementing new functionality to comply with new regulations is not enough; systems and processes also need to adjust to accommodate changes to business models driven by those regulations. New business initiatives have historically gone through due diligence processes of varying degrees of strictness and now need to satisfy control questions from the outside. All this at a time when technology is evolving at a dizzying pace providing many options that were not viable until recently. These challenges should not be perceived as all negative because the current environment presents many positive strategic opportunities. From established technology providers to the newest fintech start-ups, there is now an unprecedented choice of technology vendor options. There is a greater willingness than ever by firms to partner and develop industry solutions and to support, and in some cases create, new service providers. Meanwhile, at long last, the breadth of new functionality offered by these providers is matched by their depth of expertise. Solution providers frequently now offer not just “software” or a “service” but a complete solution package. 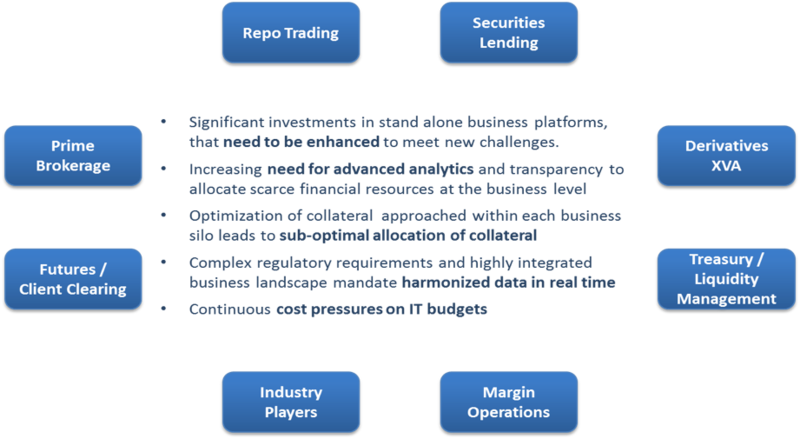 While capital markets players show increased willingness to turn to others for help in this challenging environment, there is also the recognition that the return on investment from internal technology resources needs to come from genuine differentiators in areas such as trading, data analytics, risk management and client interaction. In this world of both challenge and choice how can firms make the optimal choices without becoming stuck in analysis paralysis? At the most fundamental level they require a framework for deciding when to build, buy or network in collective enterprises. For a capital markets firm, the starting point for creating a framework is a realistic assessment of who they are, where they are going and what they are capable of. Some firms’ strengths may come from getting the basics right in areas such as operations or credit. Others may be innovators, creating new products, being the first into new markets or the first mover in the application of new technologies. Few, if any, firms can be good at everything and the effort of trying can be counterproductive. A realistic recognition of strengths and weaknesses is key. This analysis needs to be conducted front to back ⎼ including business functions, personnel and technology capabilities ⎼ to ensure the most holistic understanding is developed for optimal decision making. The next step is for a firm to understand where it wants to go, or more often in the current changing environment, where they need to go. Banks have been constrained by the pressure to build up and conserve capital. As a consequence, many formerly key business areas have shrunk or been closed. On the buy-side, active fund management, a traditionally high margin business, is under threat. Business changes such as the growth in popularity of low-cost ETFs and the rise of the robo-advisor are having major impacts on business strategy, even where the basics are sound. Whether a business strategy is expansive or reactive, or simply aimed at preserving a successful franchise, it has a major impact on a framework for interaction with technology and service providers. Lastly, firms need to assess the potential of help from external parties versus the strengths of internal capabilities. One of the most significant recent developments has been the willingness to develop shared industry resources. The general driver for this has been a recognition that many parts of a financial sector organization (including the relevant parts of infrastructure) are non-differentiating sources of costs rather than sources of competitive advantage. Though industry utilities have been around almost as long as computers, they have tended to focus on a limited set of functional areas. The new generation of utilities are appearing across front, middle and back office. Some notable examples include: FIS’s Derivatives Processing Utility which grew out Barclays; Accenture (in collaboration with Broadridge) Post-Trade Processing that absorbed business functions from Societe Generale; and more traditional projects such as Symphony, a collaboration of 16 major financial firms building a secure communication network. Another change of emphasis has been from the traditional regulatory drivers behind major utilities to more commercial drivers. In some cases, superior internal performance may actually create the opportunity for revenue generation by using that capability as the basis for an industry utility. There has been a high degree of consolidation of financial software vendors in recent years. Firms such as FIS have grown through a long running series of acquisitions (notably SunGard at the end of 2015), Broadridge Financial Solutions continues to make acquisitions, and UK based Misys recently merged with Canadian D+H to form Finastra. Consolidation has also been driven to some extent by internal procurement departments, which in many large financial services firms have worked to reduce the number of vendor relationships. Despite these trends, there has been little reduction in choice as new fintech vendor firms grow. “Innovation” or “digital” teams across capital markets firms have worked to build bridges to the more promising start-ups. Choice in functionality has been matched by choice in the type of offerings. Capital markets software is often now available as part of a comprehensive package including cloud based hosting, integration and maintenance. Newer fintech firms may not be as big as other vendors but they make up for it with speed of execution, nimbleness and innovation in driving complex challenges. They are able to adopt some of the latest technology innovations much more efficiently than their larger counterparts. Add to that the management of staff to execute the business process, and one end of the software services spectrum is indistinguishable from a utility. Still, partnering with a vendor creates the bane of any project manager: more dependencies on outside parties can mean more risks, the potential for slow turnaround and reduced control. The alternative, however, isn’t foolproof. Good internal development teams and working in genuine partnership with a business can deliver changes rapidly that are focused on a business user’s needs. However, writing new software or even carrying out the full integration of a vendor package can be a high risk and high cost strategy. The experience of difficulties rolling out new systems in financial firms’ increasingly controlled and complex environments. Many fintech firms can offer significantly deep domain and technical experience that may not be available internally. Many financial firms have difficulty in finding and retaining top technology talent as professionals have opted to pursue other opportunities in the broader technology industry or fintech space. This can make it harder than ever to deliver a project to budget, with acceptable timescales and user expectations. Even where a firm shows expertise in one area of technology, it is unlikely to have breadth and depth of resources within its IT function to do everything to the same standard. Depending on an honest assessment of the firm, its capabilities and business strategy, different choices may be made about buying, building or collaborating. If a capital markets firm’s need is for relatively standard, commoditized functionality, then the key factor becomes the gap between their offering and the firm’s needs. The wider the gap, the greater dependency on additional work being done and the greater the implementation risk. If a wide gap exists between the firm’s needs and the full range of offerings, it may be worth going back to basics and asking why its needs are so different to peers that make use of software packages or other services in the first place. If one or more potential partners can provide the desired functionality, the characteristics of the vendors themselves need to be considered. Important variables will include vendor capabilities and skill sets in terms of business domain and technical innovation, reputation in the industry, and extensibility of architecture and offering. Many large vendors provide full feature functionality but it may be hard to customize whereas some newer fintech firms are leveraging more flexible technologies to make their offering able to meet various needs. If a supplier can provide functionality that can then be extended by an internal team, it may be an advantage as firms don’t always need to rely on the vendor for critical business changes. If businesses require more innovative solutions than they are capable of mustering internally, it is likely that a partner will be of benefit. But the characteristics of the partner may become the most critical factor. Any partner chosen needs to have a genuine understanding of the firm’s needs. Genuine understanding comes from the combination of both technical skills and real-world experience. Suitable partners also need to understand the value of building a solution that is not just for today but has the flexibility to adapt to tomorrow’s challenges. Regulatory changes, such as the requirement to report securities finance trades under SFTR and margining of FX Forwards as a result of MiFID II, can have dramatic impacts. On the positive side, market changes or the rapid uptake of a new product can still lead to dramatic increases in volumes. In this case, firms need to look for a partner and not just a vendor because they may be able to help them assess their current capabilities and also help define the roadmap based on their understanding of the industry and regulatory landscape. Utilities will continue to provide their own unique solutions, but the vantage point of a buyer or user should be: “is this process sufficiently commoditized that a utility can meet my needs?” Any truly commoditized process can be outsourced to a utility, while processes that offer or require differentiation should be managed internally by the firm. Firms may also need to have internal capabilities developed in-house or through a vendor to connect to the utility and take full advantage of their services. Utilities have a lot to offer, but firms need to be proactive in making the decision about what is a competitive advantage and what is a commodity service. Creating a framework for understanding a capital markets firm’s capabilities and comparing the results to the vendor and utility landscape is the first step in deciding whether to build, buy or partner for solutions in today’s market. The catchphrase of outsourcing is easy; the hard part is ensuring that firms are building flexible partnerships for the long term. At Transcend Street, we find having a great product or solution is a good start but not enough to win the long term partnerships. Our clients reach out to us because of our team’s broad industry experience, thought leadership and our focus on execution and delivery. Our vision, its alignment for the client’s benefit, and our capacity to be a long term partner in their success is our crucial differentiating factor. As technology becomes increasingly complex, it is imperative that firms conduct a holistic review of their own capabilities and strategically identify the right partners. Too often, firms focus on features and functionality comparisons across solution providers but not enough on critical internal assessments. In the brave new world, where profits are scarce, cost pressures are high and regulatory compliance is crucial, firms that can master this strategic balance of internal builds and strategic partnerships in the industry will have a significant competitive advantage. This article was originally published in Securities Lending Times. Financial institutions today are increasingly evaluating how best to manage their collateral needs in the face of dual challenges – how to adapt their business and operational structures to become more efficient and how to respond to and comply with ongoing demands around changing regulatory requirements. These issues resemble a seemingly difficult task, like transferring passengers from one train to another, while both trains are in motion. Firms that approach front office transformation challenges, decoupled from regulatory and compliance challenge, will miss opportunities to solve larger systemic issues in a strategic and integrated fashion. We strongly believe that Technology strategy and architecture can play a critical role as firms evolve to meet these challenges.This article looks at how businesses can strategically address their collateral and liquidity management operations and regulatory needs by adopting a more holistic integration approach that takes into account their organizational complexity, unique business requirements and their compliance mandates. Firms that get this strategy right will establish a competitive advantage and maximize limited budgets by significantly enhancing their front office capabilities, while also meeting regulatory requirements. Global regulations such as Dodd-Frank, Basel, MIFID and EMIR are demanding significant changes to securities finance and derivatives businesses which are primary drivers of collateral flow. An organization’s overall portfolio mix dictates the cost of doing business, and having an integrated view of the complete liquidity situation is critical and can’t be done in isolation. These regulatory and economic forces are driving firms to integrate their collateral businesses that traditionally operated as silos. At the same time, new global regulations are mandating that firms implement specific capabilities and requirements that are often quite broad, impacting many aspects of collateral and liquidity management capabilities. Consequently, these requirements are quite onerous to accomplish especially because they need to be implemented at an enterprise level. What is Required for Front Office Optimization? Typically, financial business units were structured and incentivized to take a highly localized approach to addressing the collateral requirements for their specific business lines. This historical constraint was driven by a need for domain expertise and reinforced by budgeting protocols and performance expectations that were more closely aligned with local returns on capital, revenue and income. In the current environment, making decisions within a single function misses the opportunity to achieve broader benefits to drive valuable optimization across an enterprise. The outlying boxes in the diagram below illustrate the standard, localized organizations that exist in most firms today, where individual business units make collateral decisions without consideration of their sister business’ needs. Firms that move beyond the silo approach and evaluate and prioritize collateral and liquidity requirements in a more integrated fashion across all their collateral management processes are better positioned to ensure the optimal allocation of capital and costs, realize efficiency gains and enhanced profitability. Some organizations are doing this by establishing collateral optimization units that have a mandate to implement technology and organizational changes across multiple businesses on a front-to-back basis. Potential areas that organizations are evaluating include maximizing stress liquidity, streamlining operational processing, reducing the balance sheet by retaining high-quality HQLA and improving the firm’s funding profile by reducing liquidity buffers against bad trades for non-LCR compliant transactions. What is Required for Regulatory Compliance? While many front office businesses typically focus on creating optimal technology architecture to improve financial return metrics, there are specific regulatory-focused technology enhancements that additionally need to be implemented. In most cases, these regulatory requirements are implemented by compliance and/or operations areas potentially away from the front office functions. This is a big challenge as these requirements are at the firm level and most firms don’t have a coordinated collateral architecture in the front. In particular, Recovery and Resolution Planning (RRP) requirements, Qualified Financial Contracts (QFC) specifications, Secured Financing Transaction Reporting (SFTR) are few examples that have pressing requirements and deadlines in the near future. To fully meet these compliance deadlines within the next 12 to 24 months, most firms do not have the luxury of adopting a strategic approach to re-engineer their business and technology architecture and have been forced to take tactical steps to ensure compliance. However, it is likely that achieving compliance in a short timeframe will create huge business and operational overhead costs, as one-off solutions may not be tightly integrated and may require additional manual work and reconciliations over time. The ongoing need for changes to front office business processes will have an impact on compliance solutions – potentially causing firms to significantly increase the operational overhead of supporting these businesses. This can lead to a rather unfortunate outcome, in that costs for collateral businesses can significantly increase, despite working hard to drive cost & capital efficiencies. Firms that choose to tackle these operational and regulatory challenges head-on and invest to create and establish an integrated collateral architecture across business lines will have a significant competitive advantage. In a dynamic marketplace where business needs and regulatory requirements are constantly evolving, a component-based architecture can be an effective approach. This allows seemingly complex processes to be managed through careful consideration of the distinct business and technology architecture elements of each stakeholder to achieve the appropriate balance for their strategy in an effective manner. Real-time inventory management capabilities across business lines that can be leveraged by both the front and back-office. This is a critical component of the strategic architecture, with the key requirement of knowing firm, counterparty and client collateral by jurisdiction. QFC trades repository that is integrated across all Secured Financing Transactions as well as derivatives trades that can be linked with positions, margin calls and collateral postings. Harmonized collateral schedules / legal agreements repository across ISDA, CSAs, (G)MRAs, (G)MSLAs, triparty, etc. Enabling collateral traceability across legal entities with the ability to produce sources and uses of collateral will ensure regulatory compliance, as well as the ability to implement appropriate transfer pricing rules to drive business incentives in the right places. Utilizing optimization algorithms with targeted analytics can maximize a variety of different business opportunities and most importantly recommend actions through seamless operational straight through processing. This transition can be difficult for firms as it will need to cut across business and functional silos and it can have significant people and organizational hurdles along with technology challenges. One key point is that these changes don’t need to happen all at the same time and firms can prioritize the approach in a phased manner in line with their pain points and priorities as long as leadership is behind the vision of the holistic architecture. Many firms have started this journey and those who can make demonstrable progress in this evolution will have a significant competitive advantage in the new era. We have leveraged decades of Wall Street experience to develop strategic collateral and liquidity solutions for the largest, most sophisticated banks and financial institutions. Recognizing the unique requirements and opportunities financial organizations have to optimize liquidity and collateral across business units, we have developed solutions that address the need for Collateral Optimization, Agreements Insights, a Margin Dashboard, Real-Time Inventory and Position Management and Liquidity Analytics. Separately or in combination, these tools will help your firm take a more strategic approach to optimizing the best assets across your entire portfolio and businesses to maximize your profitability. To discuss your firm’s requirements, contact us. Following the financial crisis, regulations and their associated reporting have created an opportunity for banks and investment firms to create a single, unified collateral infrastructure across all product siloes. This does not have to be a radical architecture rebuild, but rather can be achieved incrementally. There are legitimate historical reasons why collateral infrastructure has grown up as a patchwork of systems and processes. For products such as stock lending, repo, futures or contracts for difference (CFDs), the collateral/margining process was generally integral to the products and processing systems. It would not have made sense to break out collateral management into a separate group and hence operating teams and systems were structured around the core product unit. Generally, only OTC derivatives had a relatively clear decoupling between collateral management and other operational processes. Even as business units merged at the top level, this product separation at the collateral management level often continued. While this situation could stand during non-stress periods, the financial crisis demonstrated the fallacy that siloed, uncoordinated collateral management systems, data and processes could weather any storm. This disjointed view caused a number of specific problems, including: an inability to see the full exposures to counterparties; a lack of organization in cash and non-cash holdings; and substantial inflexibility in mobilizing the overall collateral pool. Even before the crisis, inconsistent or “zero cost allocation” for collateral usage meant that collateral was not always being directed to the parts of the business that needed it most. After the crisis, with collateral and High Quality Liquid Assets at a premium, this became unacceptable. Today, few banks and investment firms have completed the work of integrating their collateral management functions across products (see Exhibit 1). Some of the largest banks are focused on building capabilities to achieve enterprise-wide collateral optimization, while others are just starting on this effort, at least on a silo basis. Some have bought or built large systems with cross-product support, although this has proven costly. Others are evaluating organizational consolidation. Whatever their current state, a new round of regulatory reporting requirements in the US and Europe means that letting collateral infrastructure sit to one side is no longer viable to meet business or compliance objectives without adding substantial staff. One way or another, long-term solutions must be achieved. While nearly all large firms have digested the current waves of regulatory reporting and collateral management requirements, the next round will soon be arriving. Among these are the Federal Reserve’s regulation SR14-1, MiFID II (Revision of the Markets in Financial Instruments Directive), and the Securities Finance Transactions Regulation (SFTR). It is worth looking at some of these requirements in detail to understand what else is being demanded of collateral management infrastructure and departments. The Federal Reserve’s regulation SR14-1 is aimed at improving the resolution process for US bank holding companies. It includes a high level requirement that banks should have effective processes for managing, identifying, and valuing collateral it receives from and posts to external parties and affiliates. At the close of any business day banks should be able to identify exactly where any counterparty collateral is held, document all netting and rehypothecation arrangements and track inter-entity collateral related to inter-entity credit risk. On a quarterly basis they need to review CSAs, differences in collateral requirements and processes between jurisdictions, and forecast changes in collateral requirements. Also on the theme of improved resolution rules are the record keeping requirements related to “Qualified Financial Contracts” (effectively most non-cleared OTC transactions). These require banks to identify the details and conditions of the master agreements and CSAs applying to the relevant trades. While the regulatory intent is understandable, these requirements are exceptionally difficult to meet without a unified collateral infrastructure. There is in fact no way to respond without a single, holistic view of collateral and exposure across the enterprise. While SR14-1 impacts only the largest banks, it still means these banks have a mandate to complete the work they have begun in organizing their vast collection of collateral information. This will lead to greater collateral opportunities for the big banks, and may in turn encourage smaller competitors to complete the same work in order to exploit similar new efficiencies. Article 15 of Europe’s SFTR places restrictions on the reuse of collateral (rehypothecation). The provider of collateral has to be informed in writing of the risk and consequences of their collateral being reused. They also have to provide prior, express consent to the reuse of their collateral. Even with the appropriate documentation and reporting in place, a collateral management department has to carefully ensure that the written agreement on reuse is strictly complied with. While nothing is written in the US yet, market participants believe that the US Office of Financial Research will soon require mandatory reporting that may entail overlapping requirements. Similarly, MiFID II introduces strict restrictions on the use of customer assets for collateral purposes and potentially has a major impact on collateralized trading products. A complicated analysis must be conducted on best execution, but in OTC and securities financing markets, best execution may be a function of term, price, counterparty risk and/or collateral acceptance. Further, any variation from a standard best price policy needs to be documented to show how the investment firm or intermediary sought to safeguard the interest of the client. SFTR and MiFID II require that banks rethink their entire reporting methodologies, and in some cases must rethink parts of their business model. A wide range of new information must be captured, analyzed, consolidated, and reported outwards and internally. This will likely generate new ideas and business opportunities around collateral usage and pricing for those firms that can digest the large quantities of new information that will be produced. The struggle at many firms to comply with regulations while maximizing profitability has led to two parallel sets of infrastructures: one for the business and another for compliance. This creates two levels of cost that duplicate substantial effort inside the firm. Along the way, business lines get charged twice for this work as costs are allocated back to the business. This is an immediate negative impact on profitability; even firms that have completed collateral optimization immediately lose a piece of that financial benefit. The cumulative impact of regulation means that banks and investment firms generally cannot afford to wait for consolidation projects to deliver a single integrated platform. The fragmentation of teams, data and processes are hurdles for any institution to overcome but so is the old mindset that simply thinks of collateral management as an isolated operational process. Map the full impacts of regulatory and profitability requirements on businesses, processes, and systems. Recognize that collateral management is an integral part of many key activities at the firm including trading and liquidity management. Understand the core decision making processes at the heart of effective collateral management. Organize and manage the data that is required to drive those processes. Build a functional operating model for collateral management. The fifth recommendation, building a functional operational model for collateral, means being able to connect together disparate business lines to provide an enterprise view of collateral. It includes mining collateral agreements to make optimal decisions or decisions mandated by regulation. It requires the ability to perform analysis of collateral to balance economic and regulatory drivers, and it requires controls and transparency of client collateral across all margin centers. At Transcend Street Solutions, we are actively working with our clients to help them develop a strategic roadmap of business and technology deliverables to achieve a holistic collateral infrastructure. While there are always organizational as well as infrastructural nuances in every business, we have seen the framework proposed above yield a positive return for our clients. Our technology platform, CoSMOS, is nimble, modular and customizable to accelerate collateral infrastructure evolution without necessarily having to retire existing systems or undergo a big infrastructural lift. Getting this right is important for more than just regulatory compliance. It means the collateral function and trading desks can perform the forward processes required to support both profitable trading and firm wide decision making. Pre-trade analytics is needed to ensure that collateral is allocated optimally across portfolios and collateral agreements. Optimization is also needed at the trade level to ensure the most suitable collateral is applied to each trade or structure. Finally, analysis needs to be carried out across the whole inventory of securities and cash positions to ensure collateral is used by the right businesses. After all, correct pricing of collateral across business lines is not only essential for firm level profitability but also incentivizing desirable behavior throughout the organization. We strongly believe that firms that are successful in achieving a holistic collateral architecture will have a significant competitive advantage in the industry. They will be able to achieve optimization of collateral and liquidity across business silos while meeting most global regulatory requirements, and all that with a much more efficient IT spend.